The 5th of May falls on a Friday this year, so you have no excuse to not celebrate Mexico’s unlikely victory during the Battle of Puebla circa 1862. You knew that’s what you were drinking to, right? 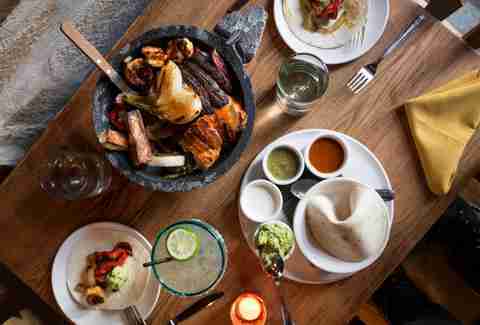 This Cinco de Mayo, skip the sad taco bowl and treat yourself to excessive quantities of fresh tacos, cheap margaritas, luxe lobster nachos, and more Mexican-inspired treats and festivities throughout the city. GUAC will be offering five specials all focused on the number five: Drink original and spicy margaritas for $5 all night, buy four tacos and get the fifth free, order five flavors of guac for $25, buy five shots and get a free large guac, and order Mexican beer for $5 all night long. Newly opened Alta Calidad will be offering $10 tequila cocktails all night long, including margaritas and the colorful and spicy El Jardin, made with fresh poblano pepper juice, cilantro, citrus, agave, and a chapulin-salt rim. 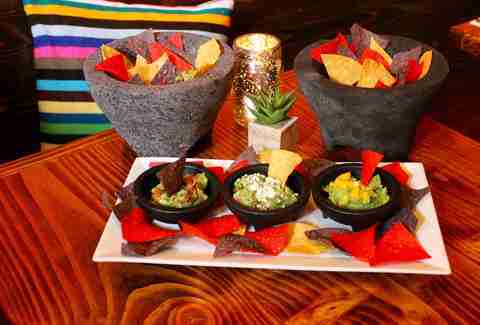 Your first cocktail comes with a complimentary queso fundido, which can be enjoyed simple or topped with artichokes, chorizo, and poblano peppers along with crisp plantain chips and house-made tortillas for dipping. 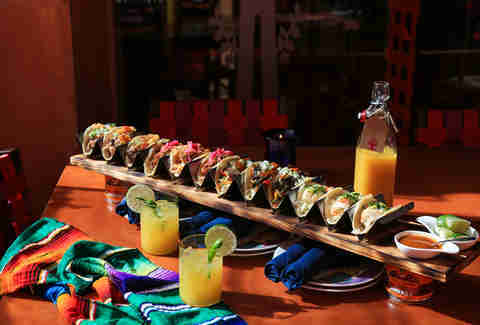 An all-day celebration with food and drink specials will culminate in a performance by a mariachi band from 6-10pm. Specials include $6 Tecate and a shot, a $9 frozen classic margarita, and festive dishes including pork belly nachos, hamachi ceviche with pea shoots, and more. El Vez Burrito, the grab-and-go spot inside the restaurant, will also have a special $13 al pastor burrito during lunchtime. If you're looking for an easy post-work escape, La Palapa, located inside Midtown food hall Urbanspace Vanderbilt, will have a "Pop-Up Cantina" featuring drink specials like $4 Tecate and $5 sangria to pair with its menu of tacos and quesadillas. $4 Tecates, $5 Modelos Especial, $6 margaritas, and $28 pitchers are just a few of the specials that should lure you into this new taco shop -- but the main draw will definitely be the $1 chicken tinga tacos. A Street Taco spokesperson promises “a 1000% chance this place will be lit on Cinco de Mayo.” So. 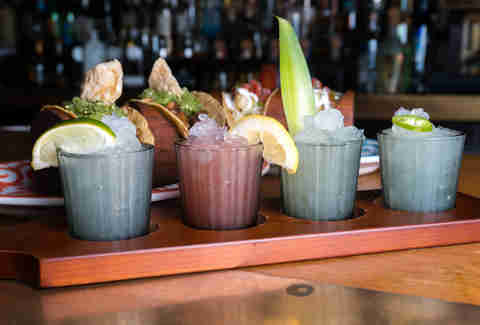 A $25 margarita flight features a lineup of four mini-margaritas, but if you’d rather share a single giant drink, Bodega Negra is also offering a Mega Margarita ($85 or $120 if you go Cadillac), topped with a Corona that’s shareable for a group of five (or less if you’re really thirsty). To soak up all that marg, five of the cafe’s most popular bites (jalapeño rellenos, grilled corn salad, chicken tacos, churros, and vegetarian tacos) will be offered for just $5 each. Artwork inspired by Cinco de Mayo and Mexico will be on view while DJ Sergio Ramirez turns this Headless Horseman gallery opening into a fiesta. Margarita specials are promised all night and admission is free. 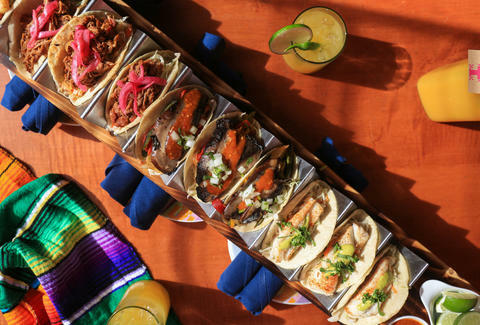 Rosa Mexicano’s dining room will be serving a special three-course menu for Cinco de Mayo, but the real fun is at the bar, where friends (and strangers) can indulge in a 3 foot spread of tacos ($48) including braised beef, grilled fish, grilled mushroom, and carnitas varieties. Drink specials, including frozen margaritas by the pitcher and a large-format spicy pineapple margarita, will also be served. In addition to specialty margaritas -- including a $5 pineapple-ginger-jalapeño creation -- Tacuba will serve special dishes like chicken flautas, lamb tacos, and a platter of nachos topped with lobster, chorizo, chipotle, black beans, jalapeños, and plenty of queso. 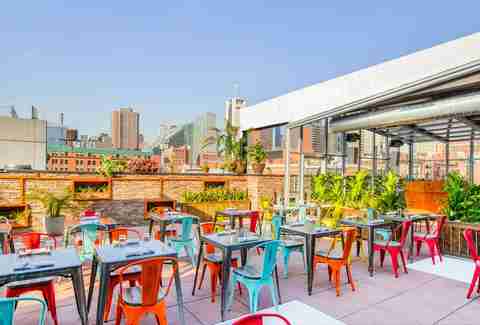 The seasonal opening of this rooftop bar coincides with Cinco de Mayo, so you can eat carnitas tacos or a whole grilled fish with tortillas and salsa as you crowd around a baby pool filled with cold beer cans for your group. Frozen cocktails will also be available, including margaritas, a rum runner, and an “Iceberg” beer topped with frozen margarita. If you’re willing to brave Midtown suits, you can drink unlimited margs for two full hours at this steakhouse chain. The party, which is co-hosted by Avión Tequila, runs from 5-7pm and includes a custom margarita bar with fruity pomegranate and peach concoctions and Mexican-inspired steakhouse snacks on the restaurant's outdoor patio. Swag and prizes are also promised. A $20 cover includes food and drink. If watching the new episode of RuPaul’s Drag Race dictates how you’re spending your Friday nights, head to Posh in Hell’s Kitchen, where the episode will screen live and Coronas will be $4, along with $5 well shots and margaritas, until 4am. In honor of the holiday, Cantina Rooftop will open at 3pm with $10 Micheladas, $12 margaritas, $50 pitchers, and all the guac, tacos, and shareable plates you can handle. While fried chicken may not be the first thing that comes to mind when you think of Cinco de Mayo, that isn't stopping Blue Ribbon Fried Chicken from bringing back its Chicken De Mayo. The massive $8.95 sandwich -- which is available for the full month of May -- involves crispy fried chicken topped with shredded lettuce, guacamole-mayo and salsa, crunchy chicken nachos, pickled peppers, cilantro, and chipotle-lime sour cream. If you've always wanted to try the Black Ant's famed grasshopper taco (yes, made with real grasshoppers), now's the time. The East Village Mexican spot will have cocktail and food specials, along with live music and DJs from 2pm 'til close. From 6-10pm, Añejo Tribeca will offer live entertainment while partiers enjoy à la carte Mexican snacks like pork belly tostada ($14) and wild mushroom queso fundido ($13). Special $12 margaritas will also be served, including a lemon thyme margarita and the “Mexican Firing Squad” margarita, brightened up with grenadine.